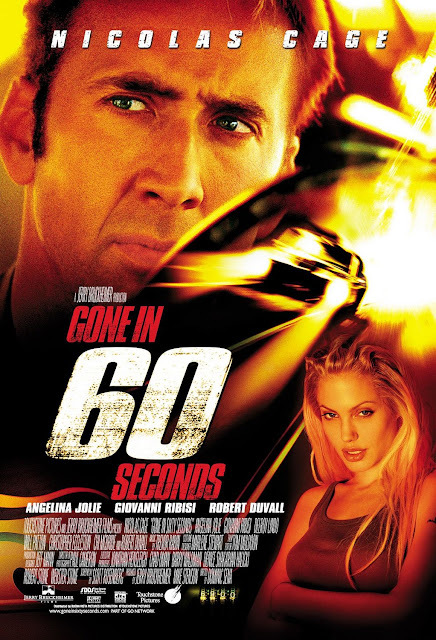 Chrichton's World: Review Gone in Sixty Seconds (2000): Whether you like it or not one of the better Nicolas Cage films! Review Gone in Sixty Seconds (2000): Whether you like it or not one of the better Nicolas Cage films! It is very strange to notice how the original Gone in 60 Seconds gets so much praise and this remake with Nicolas Cage gets bombarded with so much harshness and unfair criticism. Because like it or not it is the better film. Very flawed film which I am not going to deny. But the better film nonetheless. Why do I think this? Well, read my review of the original film then you will find out that I wasn't really impressed with that one. In fact I completely forgot having seen it once before. And for me that is a rare thing. Gone in Sixty Seconds is a film I must have seen four or five times since it came out and still manages to entertain me. That already tells me a lot to be frank. One of the reasons is the good cast. I loved how the characters interacted with each other and most of them never took the film that seriously. It's odd that the audience felt do exactly that. Actually there are two groups of people hating on this movie. Fans of the original film and people who have not been subjected to really bad films. Let me first talk about the fans of the original film. These fans didn't care for the story or the characters. They were in it for the stunts and the cars. While I think I could make a case for the cars in the remake it is obvious that the version with Nicolas Cage is less about the cars and more about the characters. So I kinda understand where they are coming from. The other group however are clueless if you ask me. What exactly were they expecting from a film about a bunch of car thieves stealing cars? It's not like it is Shakespeare or something. It's the premise (where main character Memphis Rains has to steal 50 luxury cars within 4 days) that provides the majority of the thrills. How will he pull it off? Will he fail or succeed? Basically this version is a heist movie. And that requires a completely different mindset. On top of that this film does give us plenty of stylish action and stunts to keep the action lover happy. And trust me if I say I would be the first to complain of the lack of if it wasn't good. Gone in Sixty Seconds never pretends to be more than it is. Even Nicolas Cage is fully aware that he is in a cheesy film and acts accordingly as often as possible. Hell even Christopher Eccleston knows he is nothing more than a cartoon villain. Hence him getting upset about a wooden chair he crafted. And let's face it people whether you like it or not this is one of the better Nicolas Cage films. It doesn't look like he is going to making real good ones in a long time so please be more forgiving. An entertaining and fun film. Nothing more and nothing less.